On June 6th, 2017 Dutchess County of New York State filed a lawsuit against 11 pharmaceutical companies on several allegations regarding their production and distribution of prescription opioid painkillers. The lawsuit alleges that pharmaceutical companies have used deceitful tactics to market prescription opioid painkillers, an epidemic that has swept across the nation resulting in several deaths that only continue to increase by the year. Keep in mind, considering the date of the lawsuit, that nothing has come of the it and Dutchess County is not necessarily setting a precedent as 5 other New York State counties have filed similar lawsuits against pharmaceutical companies and individual providers. There are 62 counties in New York State. As has become the norm in a capitalist society like the United States, money is a powerful and nearly undefeated entity. How often do you see money being the driving force behind evil and selfish acts? It’s safe to assume money is the driving force behind the companies and providers turning their back on a public health crisis, even if it didn’t start that way. Addiction is a disease, as is cancer, and the former is much easier to turn your back on. The problem is spreading and there does not seem to be an end in sight. Several states are seeing the devastating effects of the opioid epidemic, including Vermont. In fact, Vermont ranks ninth among the National Safety Council’s top 10 states with the highest heroin fatality rates per capita. So, what gives them a right to blame the companies and prescribers? Is it pure ignorance? As it is for many professionally licensed providers, there are annual continuing education requirements. Any responsible doctor would take note of the rise in deaths due to prescription opioid use. If you’re wondering why pharmaceutical companies and individual providers are being held accountable, the above statistics should be telling. Not only have patients become addicted to pain management medications prescribed by their doctors, they seem to be seeking out the drug after the prescription has lapsed. To the naysayers that may point to our population growth in America, which has grown 14% between 1999 and 2015. The population growth of 14% pales in comparison to the 295% increase in prescription opioid deaths over the same time frame. If we’re aiming for population control then we have the answer. There are some states that are considered to be doing it “right”, most notably, the state of Vermont, which is just a mere ninety miles from the center of Dutchess County, NY. Now that we’re shifting away from the most recent lawsuit in New York, let’s see what their neighbors are up to, besides filing lawsuits. Wait, the opioid deaths did not increase 295% in Vermont? Yes, the same number of people died at the hands of prescription drugs but they must be doing something “right” in Vermont. It’s not the dark alley dealer we have to worry about. It’s the people that are supposed to care about our health and well-being. How is Vermont Preventing Prescription Opioid Misuse? Particular to mandatory prescriber education and opioid prescribing guidelines, at first glance, it could seem like just more charting in an attempt to decrease liability with a smoke screen of caring for the patient. However, it seems the amount of charting that needs to occur cannot be fudged or faked as there are too many stipulations in place that call upon the doctor to be, well, a responsible doctor! For example, when prescribing an opioid painkiller the prescriber must evaluate the benefits and risks, including risk of misuse. Additionally, the provider will need to produce a diagnosis that supports prescription opioids and consider and document the possibility of a non-opioid alternative as well as a non-pharmacological treatment. These doctor and patient education attempts will help prevent the patients from confusing the drowsy eye warning on the bottle as a “wink, wink” suggestion, much like Lucille Bluth, of the cult television show, Arrested Development. If you’re looking for a hole in Vermont’s approach, you must read on to determine if you feel it’s a credible approach. What’s been described in the preceding section is a small part of the process, the opioid initiation stage. How should we expect doctors, especially ones that see dozens of people on weekly basis, monitor opioid use after the initial prescription? Treatment goals are not met despite escalating doses. The patient’s history and/or a screening indicate high risk for misuse, abuse, diversion, addiction, or overdose. The prescriber knows or suspects based upon reasonable grounds that the patient has engaged in misuse of opioids or other substances. The patient obtains prescriptions from multiple prescribers and/or multiple pharmacies. Reevaluation of effectiveness and safety of the pain management plan and the patient’s adherence to the treatment regimen. Functional status examination of the patient. Review of the Controlled Substance Treatment Agreement and Informed Consent, and any revisions to the conditions. Related actions that may prompt adjustments to treatment, including aberrant behavior, early refills, or other factors reasonably suggesting risks associated with misuse, abuse, diversion, addiction, or overdose. Of the aforementioned elements, especially within the one year mark, what sticks out the most the requirement to assess for comorbidity. Yes, the patient may have come with back pain due to recent surgery however, he or she may have developed an addiction over time, especially due to the vulnerability a physical ailment can create. Those suffering from an injury or that are in recovery cannot always participate in regular activities, may be bed ridden at times and feel alienated from their social group. All of those elements could result in depressive symptoms, which put someone at much higher risk to misuse or abuse drugs. As indicated earlier, addiction is a disease and must be recognized and treated as such. While Vermont is seeing their most significant decrease in prescription opioid misuse in the 18 to 25 age range, the Substance Use and Mental Health Services Administration found that the rates for mental illness and substance use disorders were the highest (35.1%) for people in the same age range. While the opioid epidemic is alive and well, it’s a welcome sight to see Vermont attempting to increase their treatment capacity to deter the effects to their residents. Much like the tobacco industry’s settlement with 46 states in 1998, the wave of lawsuits may force the pharmaceutical companies to take more responsibility for ignoring or downplaying the addictive nature of opioids. In the tobacco settlement the tobacco industry agreed to make ongoing payments to the 46 states involved to fund anti-smoking campaigns and public health programs. With the current climate of healthcare and the increasing cost, a similar settlement could be applied to the opioid epidemic. In the meantime, other states should be following in the footsteps of Vermont because, just like tobacco, much of the damage is already done. The patients are hooked. What makes this even worse is that many of those hooked started with trying to get help. We’ve learned quite a bit since the time period of doctors recommending smoking. Let’s not be so naive again. This entry was posted in Heroin, Opiates, Opioids on June 13, 2017 by Sean Callahan. Between 2000 and 2014, American rates of death from opioid overdose have tripled from three deaths per 100,000 people to nine per 100,000. That adds up to 28,647 deaths in 2014. While the number of heroin overdoses has made a rapid climb, the majority of the lethal overdoses involve prescription opioids – and the heroin crisis is closely tied to prescription drugs, since many users become addicted to a prescription opioid before switching to the street drug. In March 2015, U.S. Department of Health & Human Services Secretary Sylvia M. Burwell announced an initiative targeting three priority areas to tackle the opioid epidemic and help save lives. These include: improving prescribing practices, expanding access to and the use of medication-assisted treatment, and expanding the use of naloxone. The abuse of opioids, a group of drugs that includes heroin and prescription painkillers has had a devastating impact on public health in this country. According to the CDC approximately 100 Americans died from drug overdose every day in 2010. Prescription drugs were involved in well over half of the 38,300 recorded fatal overdoses and opioid pain relievers were involved in 16,600 of those deaths. Research shows that many non-medical users obtain prescription medications from family and friends. 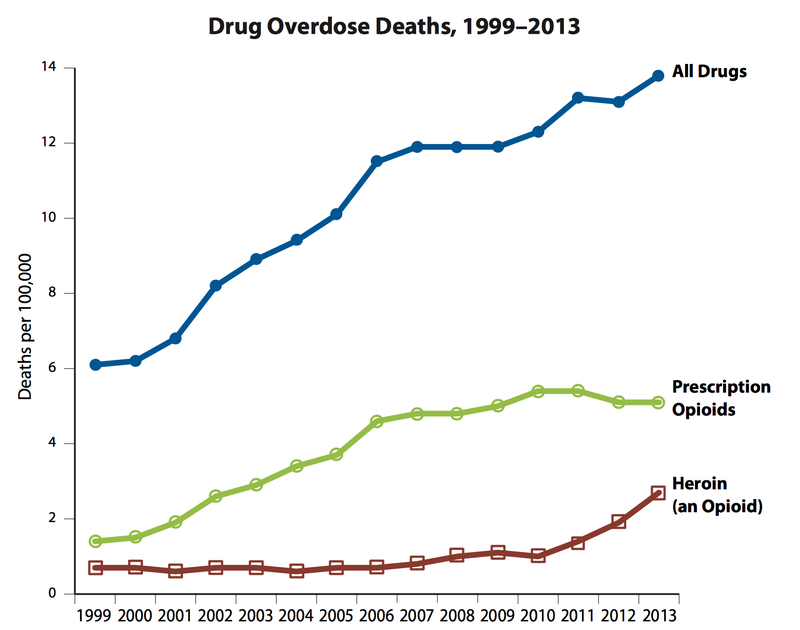 Today, more Americans die from drug overdoses than car crashes or gun fatalities. In total, drug overdoses killed 47,000 people in the United States in 2014, the latest year for which data is available. That’s 130 deaths per day, on average. The majority of those deaths – 29,000, or 80 per day – involved an opioid. Between 1999 and 2014, the overdose epidemic spread from a few concentrated pockets in Appalachia and northern New Mexico to nearly every corner of America. The opioid overdose crisis began early in central Appalachia, a region encompassing much of West Virginia and eastern Kentucky. The largely rural area – dominated by physically taxing industries, including coal mining, agriculture and timbering – was susceptible to the pain-relief promise of prescription opioids such as OxyContin and Vicodin. These painkillers were aggressively marketed throughout the 1990s and early 2000s. As prescriptions proliferated, so did misuse and abuse. In central Appalachia, as in many parts of the country, the prescription painkiller epidemic also fuelled the influx of a cheap, alternative opioid: heroin. As painkiller-related deaths began to fall in the early 2010s following federal and state crackdowns on prescription opioids, heroin-related deaths began to rise. In the west, New Mexico showed earliest signs of the looming overdose crisis, but Utah was not far behind. The state’s overdose death rate climbed steadily during the early 2000s, driven by growing prescription opioid dependence. But Utah lawmakers took action early. In 2007, they established a two-year public health-based program to combat painkiller misuse. Over the next three years, prescription opioid-related overdose deaths dropped more than 25%, but the success was short lived. After funding ran out in 2010, deaths began to climb again. Drug overdose deaths in Utah continue to be fueled by prescription painkiller misuse, often in combination with other depressant drugs . Though heroin deaths have made a smaller impact in the state, they are also on the rise. Now, six years after the Prescription Pain Medication Program program ended, the Utah house of representatives declared drug overdose deaths to be a public health emergency, and passed a slate of new public health measures, including the legalization of needle-exchange programs. New England is grappling with a more recent scourge. Since 2013, New Hampshire, Massachusetts, and other north-eastern states have seen large spikes in overdose deaths attributed to increasing heroin use and the introduction of a new deadly drug: Fentanyl. Fentanyl, a synthetic opioid 50 times more potent than heroin, first appeared in the region around 2012, making its way down from Canada. Suppliers often cut the drug into heroin or other substances before selling it to users who may not know exactly what they’re buying. Because of its strength – and users’ unfamiliarity with it – fentanyl has proven particularly deadly. In the face of these new challenges, Massachusetts and other north-eastern states have begun to expand prevention efforts and access to treatment programs. Naloxone, a drug that can reverse opioid overdoses, has become more widely available throughout the region and local harm-reduction initiatives are being tested. Meanwhile, Fentanyl has surfaced in several more states, including Ohio and Florida. Florida, once known as the prescription drug capital of America. began cracking down on “pills mill” clinics in 2010. Soon after, the state’s drug overdose death rate took a downward turn, declining through 2013.But by 2014, deaths were inching back up in Florida too. Florida did a good job of cracking down on the supply side, but at the same time they actually cut treatment funding. Not addressing the demand side of the problem has contributed to the continuing of the epidemic. Though postponed for a few years, Florida’s overdose crisis has progressed along a familiar pattern: a wave of prescription opioid abuse followed by heroin and, soon after, fentanyl. More recently, fentanyl has cropped up in a previously unseen form: fake Xanax pills. The “death pills”, as they have become known, have also been found in California, Indiana and other parts of the mid-west. In October 2015, the President issued a Memorandum to Federal Departments and Agencies directing important steps to combat the prescription drug abuse and heroin epidemic. You can find it here. In March 2016 HHS awarded $94 million to health centers in Affordable Care Act funding to help treat the prescription opioid abuse and heroin epidemic in America. This funding covers 271 health centers in 45 states, the District of Columbia, and Puerto Rico to improve and expand the delivery of substance abuse services in health centers, with a specific focus on treatment of opioid use disorders in underserved populations. Administered by the HHS Health Resources and Services Administration (HRSA), these awards to health centers across the country will increase the number of patients screened for substance use disorders and connected to treatment, increase the number of patients with access to MAT for substance use disorders and opioid treatment, and provide training and educational resources to help health professionals make informed prescribing decisions. This $94 million investment is expected to help awardees hire approximately 800 providers to treat nearly 124,000 new patients. Research demonstrates that a whole-patient approach to treatment through a combination of medication and counseling and behavioral therapies is most successful in treating opioid use disorders. In 2014, over 1.3 million people received behavioral health services at health centers, This represents a 75 percent increase since 2008 and was made possible with support from the Affordable Care Act (ACA) and the Recovery Act. Do you think about drugs a lot? Did you ever try to stop or cut down on your drug usage but couldn’t? Have you ever thought you couldn’t fit in or have a good time without the use of drugs? Do you ever use drugs because you are upset or angry at other people? Have you ever used a drug without knowing what it was or what it would do to you? Have you ever taken one drug to get over the effects of another? Have you ever made mistakes at a job or at school because you were using drugs? Does the thought of running out of drugs really scare you? Have you ever stolen drugs or stolen to pay for drugs? Have you ever been arrested or in the hospital because of your drug use? Have you experienced an opioid overdose? Has using drugs hurt your relationships with other people? If the answer to some or all of these questions is yes, you might have an addiction. People from all backgrounds can get an addiction. Asking for help is the first important step. Visiting your doctor for a possible referral to opioid treatment is one way to do it. You can ask if he or she is comfortable discussing drug abuse screening and opioid treatment. If not, ask for a referral to another doctor. You can also contact an addiction specialist about opioid rehab. There are 3,500 board-certified physicians who specialize in addiction and opioid treatment in the United States. This entry was posted in Addiction, Heroin, Opiates, Opioids, Treatment on August 26, 2016 by Sean Callahan. Pop superstar Prince found dead from an overdose of Fentanyl. In recent years, fentanyl has become a favorite of opioid addicts, because it’s extremely potent and packs a near-instantaneous high. That’s also what makes it so deadly. It can kill in seconds, and fentanyl overdoses are a growing problem in the U.S. It is 80 to 100 times stronger than morphine and 20 to 40 times stronger than heroin. It is cheaper than heroin, so drug dealers lace their products with it to increase their profit margins. People who buy heroin often don’t know that it has been cut with fentanyl. The DEA issued a nationwide alert last year to warn law enforcement officials that the drug could be fatal even in small doses. The drug was introduced into medical practices as an IV anesthetic in the 1960s. Today it’s legally available by prescription as a treatment for cancer pain that returns while you’re on other opioids. But it’s also made in clandestine labs and imported into the U.S. as a street drug. 351 people overdosed fatally on opiates last year in New Hampshire, according to data provided by the state’s medical examiner. Twenty-eight of those victims overdosed on heroin alone; fentanyl was a factor in 253 of the deaths. According to the FBI, of the 4,585 fentanyl stashes that the DEA reported seizing in 2014, 10 states made up 80% of the haul — with Ohio, Massachusetts, and Pennsylvania in the top three spots. Ohio’s 1,245 seizures almost doubled the amount in Massachusetts (630), making it ground zero for the drug. In 2014, Ohio recorded 514 fentanyl-related overdose deaths, dramatically outpacing the 92 they saw in 2013. The danger of Fentanyl lies first in its potency and its immediacy. Originally prescribed as an anesthetic, fentanyl is now classified as a Schedule II narcotic drug, meaning it is highly addictive and incredibly toxic to experienced and new users alike. As the popularity of heroin abuse among young adults’ increases, so does the number of fentanyl-heroin related deaths. In a two-year span, more than 1,000 deaths were caused by fentanyl-heroin overdoses in the United States alone. The effects parallel that of its opiate family members, heroin and morphine, at a much more intensified height. Its dangers, therefore, are often disguised by other drugs’ effects. Fentanyl causes euphoria, but it can also make users drowsy, confused, or nauseated when used in combination with other substances. Just as opioid overdose can completely terminate a person’s respiration, fentanyl overdose can quickly cause a user to stop breathing. One user can inject their normal dose of heroin (or what they believe is pure heroin, but actually mixed with fentanyl) and fall unconscious before they pull the needle out of their arm. A safe fentanyl detox requires specialized medical detox knowledge and skills. Fentanyl detox can sometimes require special, advanced medical detox protocols, to avoid the weeks or months of painful, step-down withdrawal similar to the advanced protocols used for high dose methadone detox. These special, advanced fentanyl detox protocols are not widely available. According to the National Survey on Drug Use and Health, 4.3 million people aged 12 or older reported currently using prescription pain relievers for non-medical reasons. Since secrecy surrounds addiction, this is likely an underestimate. Addiction is shrouded in efforts to hide behaviors from others and addicts struggle in isolation, but you can choose a different path where effective support and help are yours for the asking. If you or someone you know is addicted to Fentanyl seek help now! You don’t have to deal with your addiction alone. This entry was posted in Opiates on July 28, 2016 by Sean Callahan. Death by Overdose, these words are scary to hear today. With prescription drugs and heroin quickly flooding schools throughout the United States we tend to hear this more and more. According to the National Institute on Drug Abuse there was over 25,000 Deaths from Prescription Drugs and over 11,000 Deaths from Heroin in 2014. Opioids are the most common type of prescription drug abuse that results in death by overdose. Respiratory failure is typically the cause of death in cases of opioid overdose. Prescription painkillers, such as OxyContin and Vicodin, were responsible for more than half of all drug overdose deaths. Most people who start abusing prescription opioid drugs quickly find themselves turning to illicit street drugs such as heroin for a cheaper and faster way to get high. An estimate of 45 percent of people who use heroin also are addicted to prescription narcotic painkillers. There is an extreme rise in death by overdose amongst teens and young adults throughout the united states. Many reports showing that young adults ages 19 to 25 are particularly at risk for a fatal overdose. The national overdose death rate for that age group is 12.7 percent per 100,000. Many say these young people have no fear of death, the truth of the matter is they are victims of a horrible disease that is consuming them and like many others before them they may end up paying the ultimate price, their life. To beat their addiction and prevent themselves from becoming another death by overdose statistic there is an immediate need for addiction treatment. If you are suffering from an addiction to drugs the first step is admitting that you have a problem and asking for help. This could be reaching out to a loved one, turning to your doctor or making a very important phone call to an addiction treatment center. For years you have battled with addiction, leaving you life on the line. Today is the day you take your life back and get the help you truly need. This entry was posted in Addiction, Heroin, Opiates, Opioids on April 16, 2016 by Sean Callahan. Your child is entering seventh grade soon. You’ve got the notebooks, the pens, the bookbag, and the cool new Nike shoes. At 12 or 13 years old, your child is excited to go back to school, see what homeroom they get, and to see friends. He or she is also excited to score some marijuana and oxycodone on lunch, except you don’t know that? How could you? It will only have been your child’s third time doing pills. The pot is regular by now. How is this happening? You find a pipe in your child’s bedroom; a week later it’s a bag of pills. How is this real? You raised your child to stay clear of drug abuse. This can’t be happening. Maybe it’s not happening to you, but it’s definitely happening in the world. Studies show a small but non-negligible number of eighth-graders abuse heroin. Ten percent of eighth-graders consider narcotics easy to find. Over 10% of eighth-graders smoke marijuana and/or cigarettes, and the percentage is slightly lower for alcohol abuse. The numbers are overall slightly lower than in the last five years, which indicates steps in the right direction are being taken, however disapproval of drug use among eighth-graders has declined. 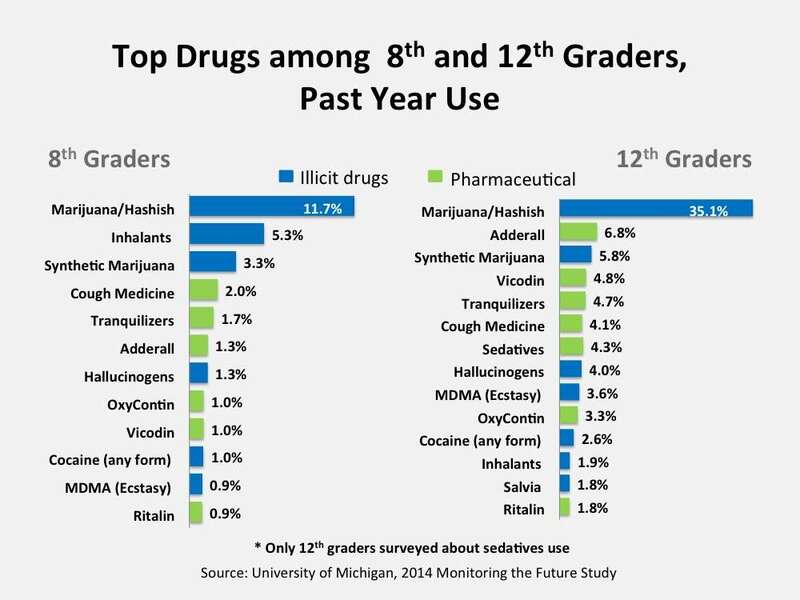 This means more and more middle-schoolers are accepting drug use. Nine out of ten people addicted to drugs and/or alcohol began using before age eighteen. For the vast majority, that means the addiction began in high school or even sooner. These are sad statistics but the problem is preventable. More elaborate drug and alcohol education, pumped up law enforcement agencies, stricter parental guidance, and more community-based programs for children are a few among many actions needed to be taken in order to prevent teen addiction. This is not to say action is not being taken; several states have recently implemented action plans to combat teen addiction. The true problem here is money. Further education means paying teachers and counselors. Pumping up law enforcement agencies requires governmental funding. Stricter parental guidance can even be costly, as it would mean possibly forgoing an occupation. Community-based programs are not free either. Not to mention, the costs of teen addiction are bewildering. In fact, teen addiction is the single most costly preventable public health issue in the country. “The immediate costs per year of teen substance use include an estimated $68 billion associated with underage drinking and $14 billion in substance-related juvenile justice costs,” according to a study by the National Center on Addiction and Substance Abuse. With so many billions of dollars being spent on the aftermath, one can only hope the funding and human effort will come and end this epidemic. As parents, we have to talk to our children openly and honestly. Warn them of the inevitable encounters with drugs and alcohol, and teach them methods of avoiding use. Be aware of the symptoms and signs that teens exhibit when using and/or addicted to drugs or alcohol. As educators and officials, open and honest in-depth education on drug and alcohol abuse needs to be enforced. While perhaps not suitable for all schools, consider what some New Hampshire middle-schoolers are learning: how to use and administer anti-overdose medication. If you are a teen and you or someone you know is abusing drugs and/or alcohol, it’s time to seek help. Talk to your parents or another trusted adult about Teen Addiction Anonymous. Speak with the professionals at your school. Help is available. This entry was posted in Addiction, Opiates on April 16, 2016 by Sean Callahan.